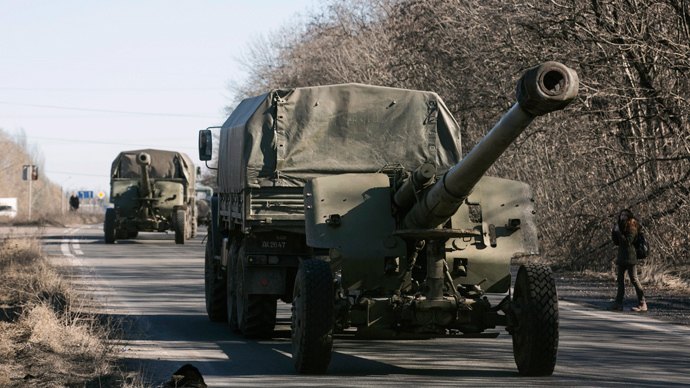 Heavy weapons and artillery systems are being withdrawn from the demarcation line in eastern Ukraine, according to a report issued by monitoring mission of the OSCE, which observed at least four eastern militias’ convoys over the past days. In its latest report, the monitoring mission of the Organization for Security and Co-operation in Europe has described the implementation of the package of measures agreed during the Minsk-2 deal, among which the top priority was the pull back of heavy weapons by both sides of the conflict from the demarcation line in eastern Ukraine. The report said that the OSCE monitored the withdrawal of weapons by eastern militias, though it did not mention any similar actions by Kiev troops. 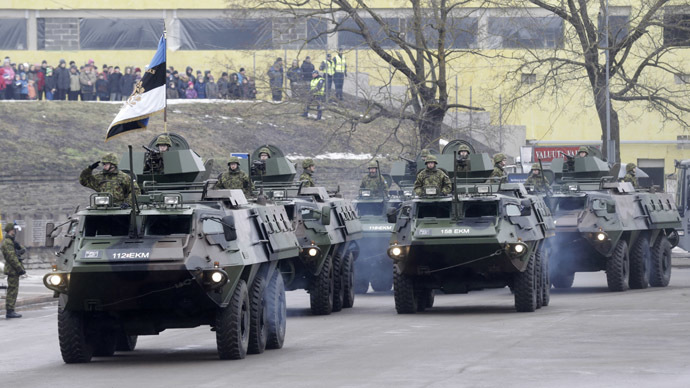 The mission monitored the militia pulling back a convoy of “four tracked Howitzers, one military-style jeep and one support truck” at a location five kilometers east of Donetsk city on February 28. The same day the mission saw another convoy close to the Donetsk controlled Bezimenne, 101km south of Donetsk, which consisted of “one Armoured Personnel Carrier (APC), four tracked Howitzers, self-propelled cannons and two military-type support vans”. 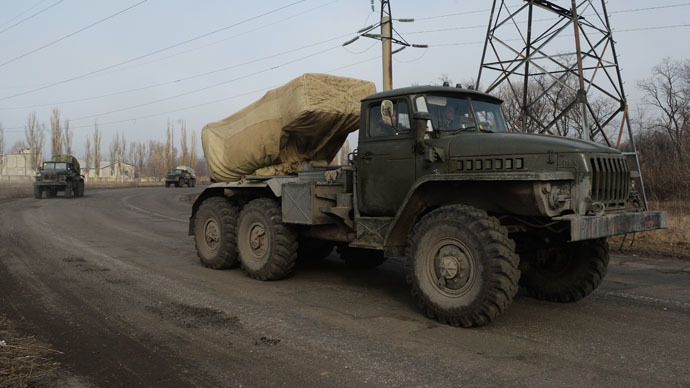 In addition to “one empty Kamaz truck, one empty Ural truck, and six BM-21 Grad Multiple Launch Rocket Systems (MLRS)” which were monitored in the rebel-held Torez area, 61km east of Donetsk. On Sunday, “one Ural support vehicle and six Grad MLRS (each one loaded with 40 240x122mm rockets)” was monitored in Bezimenne. “The SMM followed each “DPR”[Donetsk People’s Republic] convoy on routes leading from the contact line, to locations described by the respective “DPR” convoy commanders as being the final destination for this equipment, behind the relevant withdrawal line. The SMM intends to monitor these locations on a daily basis,” the report said. The Lugansk representatives also invited the OSCE monitoring mission to monitor the artillery positions near Bryanka. The report said that two of them were empty of heavy weapons and at the third position, the mission observed five towed howitzers, and monitored them as they were moved to a position 10km south of the rebel-held Volnukhino, 24km south of Lugansk and 43km south of the demarcation line. 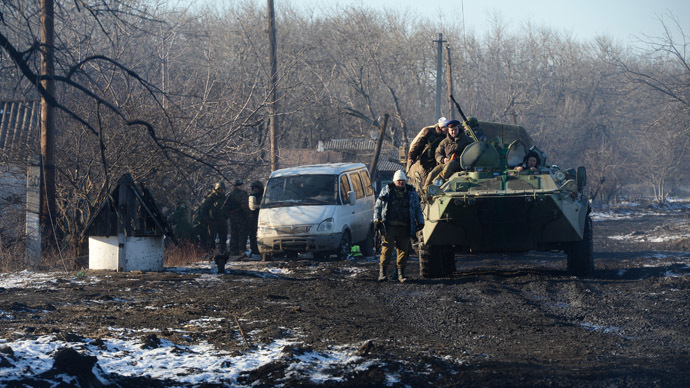 The monitors also reported the withdrawal of weapons from Zorinsk, Ivanovka, Stakhanov, Yujnaya Lomovatka, Samsonovka, Rebrikovo settlements. 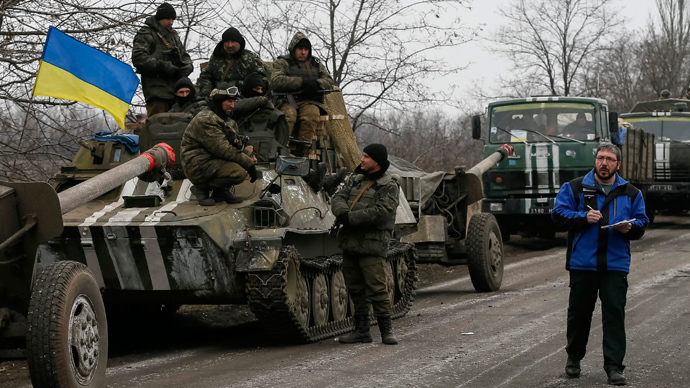 Meanwhile, the Ukrainian army has failed to pull back any “considerable” number of artillery systems from the demarcation line, DPR spokesman Eduard Basurin said on Monday. 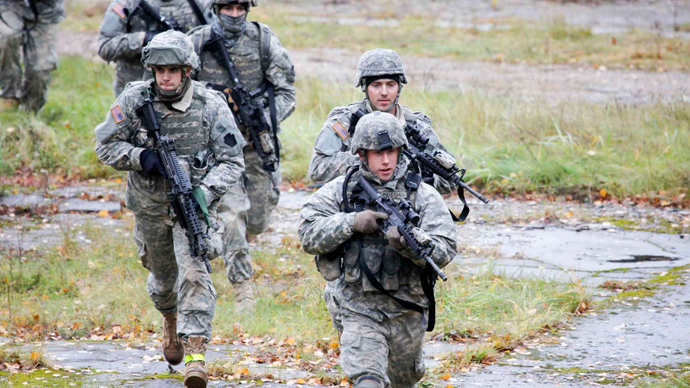 “Kiev’s delays in fulfilling its liabilities concerning the pullout of heavy weapons from the actual line of engagement create prerequisites for disrupting the implementation of the Minsk agreements by the Ukrainian side,” he added. The Minsk-2 memorandum agreed upon by both sides of the conflict in particular envisioned a ban on the use of all weapons and withdrawal of heavy artillery to a distance of 15 kilometers from the demarcation line from each side. The OSCE mission was tasked with monitoring the implementation of the agreement, brokered by the ‘Normandy Four’ – Kiev, Russia, France and Germany. In a telephone conversation with Angela Merkel, Francois Hollande and Petro Poroshenko on Monday, Russian President Vladimir Putin again stressed the need for strict adherence to the set of measures agreed in Minsk last month. The observance of the ceasefire and continuation of the withdrawal of heavy weapons under the supervision of the OSCE topped the agenda, the Kremlin said. The leaders urged the OSCE mission on the ground to regularly share information with the public. “As soon as the conditions have been fulfilled, the working group that was set up in Minsk should move forward in tackling further steps, such as preparing the local elections in the regions of Lugansk and Donetsk,” German government spokesman Steffen Seibert said.